My Journey to Fit: HydraQuiver Review! Last year, around this time, I noticed that my right elbow was hurting. Now, being a left-hander, I couldn't figure out what in the world I was doing that would cause pain there - I even considered knitting as the issue, but you use both hands for knitting, and my left elbow felt fine. Eventually, I realized that the pain was coming from holding my water bottle while running - think about bending your elbow at a 90 degree angle and keeping it there for a couple of hours at a time once a week during a long run, plus doing that for a shorter period several other times throughout the week for 45 minutes or so - add in the weight of the water in the bottle, and yep. That was the cause. So, even though I didn't really like wearing a fuel belt back in 2010, when I was given one at the USAFit organizer's conference back in March, I figured I'd give it a try again. Guess what? I lasted through one short run with it and swore it off - I just do not like having anything around my waist like that when I run. I continued to run with my handheld water bottle, but I kept looking around, thinking surely there must be something out there that would work for me. My take on the HydraQuiver? I love it! I was a little surprised at how quickly I adapted to wearing this backpack system - I wondered if it would feel too heavy, or make me overheat, but nope. After the first run with it (3 miles), I was hooked! The only thing I noticed, and that was just for the first time I used it, was that I could hear the water sloshing in the bottle, which made sense since it was located closer to my ears. But after that, I tuned it out and haven't noticed any sloshing since. The padded pack sits pretty high on your back, between your shoulder blades. You cinch it snug with their super-soft webbed straps, and it doesn't bounce at all. I wasn't feeling any bouncing, but I asked several of my running buddies to observe me during our runs, and they all said it wasn't moving, just as I thought. The straps fit under your arms, and you might think there could be chafing potential, but nope. I used this for our 9 mile rain run, and I had zero chafing. Not even a mark anyplace where the pack touched my body - I think that's pretty amazing. Post 9 mile run - I forgot I even had it on as we posed for our rainy pictures! The bottle that comes with the pack is 24 oz. While we have water set out on our routes to refill our bottles, with this size, I don't have to stop at each station now. It has a tapered bottom that makes fitting it into the holder really easy, which is nice considering you're doing that action blind. And even though you have to reach behind your back to get the bottle out, the pack sits high enough that I don't feel like a contortionist - they say if you can scratch the back of your head, you can get the bottle out, and they are right. There is a huge zippered pocket on the back - I use this for items I don't need to quickly reach. My iPhone 4 fits in with tons of room to spare; the new gigantic iPhone 6 would fit in with no problem. The pack isn't completely waterproof, so I'd still put my phone in a baggie before zipping it into the pack. There is also a key hook inside the zippered pocket. You can see how the barrel holder for the water bottle is tapered slightly bigger at the top, which helps to fit the bottle in easily. 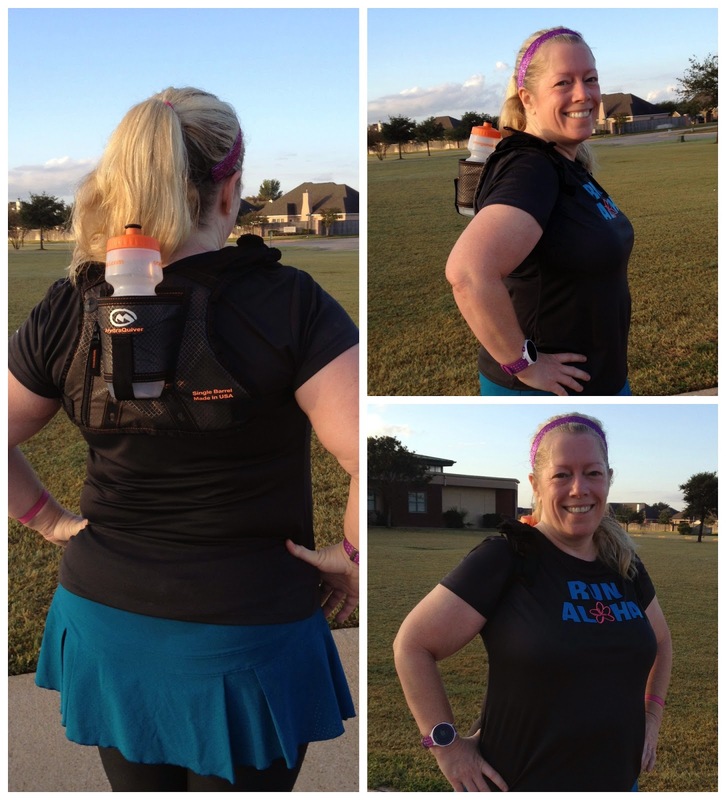 The shoulder straps have soft expandable pouches that can hold things you need to get to while you're running - for me, it's my fuel and my lip balm. I randomly crammed three GU's into one side and there was plenty of room for more. Last week I filled both pockets with all kinds of fuel...I didn't need nor did I use most of it, but I just wanted to see how it felt. I didn't notice it at all once the pack was on. 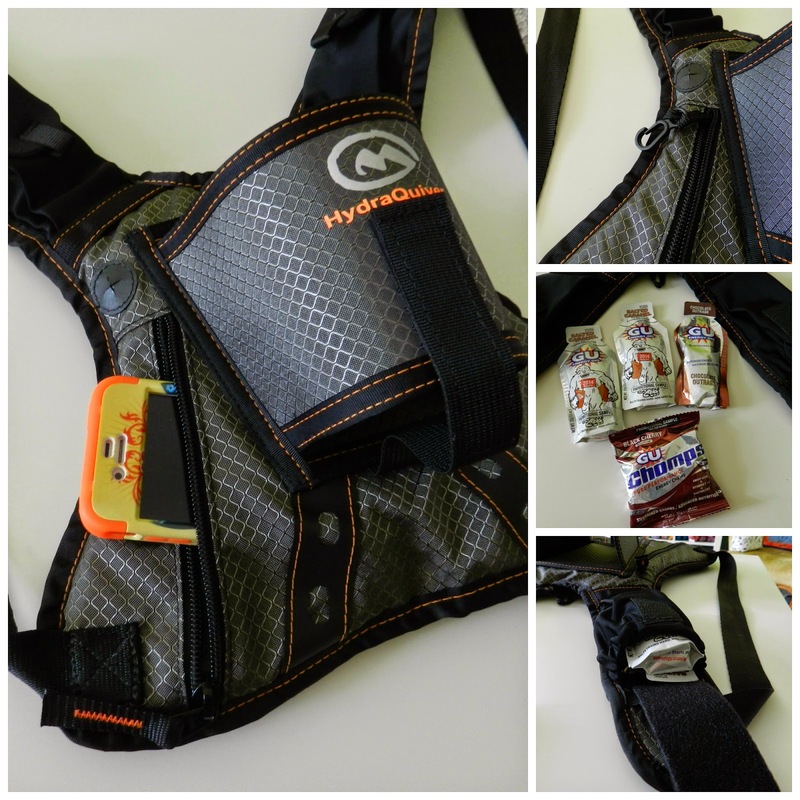 The pouches have a Velcro closure system, which makes it easy to open and remove items as you run. Other things of note: The pack doesn't have a chest strap - it just cinches at the shoulders. I like this a lot...being female, I don't want anything crossing my chest other than my sports bra. The pack is made in the USA. The construction is solid; it feels like it's going to last, but if something goes awry, there is a limited lifetime warranty. I'm really glad I took a chance on the HydraQuiver. If you'd like to try it, Orange Mud is offering my readers a 10% discount on any of their products - click here and use the code MYJOURNEY. And please, let me know if you get a HydraQuiver for yourself, and if you like it as much as I do! Disclosure: I was given a discount to purchase this product, and this review includes a referral link for me. I dont need this but but but moving back to TEXAS is an excuse to get this---right?? I don't like holding things in my hand during a run, that's where we are different. I don't mind the belt around my waist. Think you found a great solution for yourself. It isn't that good to run with a bottle in your hand, it gets you out of balance and can get you injured in the end (read it on Dutch runnersworld website recently). So this is the best solution for you, glad you found it. Hmmm, interesting about the unbalanced issue with holding a bottle! I wondered if I'd feel strange NOT holding something, since I've run that way for so many years now, but I adapted really fast. I hope you've found your hydration answer! I can't stand holding anything in my hands - or having something strapped to my back. Years ago I tried the camel back system and literally ended up ripping it off mid-run about 3 runs in. (Interesting, it doesn't bother me when hiking, only when running.) Therefore, I am a Fuel Belt girl all the way. Not to mention that I need more than 1 bottle as I need both Nuun and water during my longer runs! But, isn't it great that we runners have so many options?!! Wow, first of all, I'm so glad you figured out the mystery of the elbow. A dog holder! Maybe a miniature dachshund would fit in it...LOL. Glad you found something that works for you! Me, I couldn't reach the bottle - I can't scratch my back or even come close to touching my hands behind my back - damn shoulders! No, it's if you can touch the back of your head - I bet you could reach this. Also, sounds like you and I could be yoga buddies with those poses where you're supposed to reach and wrap your arms behind your back - I am miles (slight exaggeration??) away from touching! How cool is that? If I was still running, that would be something I would totally try. It sorta, kinda, not really reminds me of my Camelbak I never used (still has the tags)! So much better to have a bottle to wash vs. a blister pack! I used a Camelbak way back when (circa 2009/10) and not only does this take up much less real estate on your back, but it's super easy to fill the bottle (vs. the bladder of the Camelbak). You would like it! This looks great for hiking trips and wearing in our kayaks. Wish I would have seen this earlier in the year. I'm going to test the waters to see if my daughter might like one for Christmas. Great detective work to figure out the elbow issue - that kind of thing can be hard to diagnose. I hate to carry a water bottle when I walk, so this is intriguing. Little too costly for me right now, but maybe it could be a future reward. Well, you KNOW I kept thinking "please don't be knitting" when my elbow was hurting! I have the Double Barrel Hydra Quiver. It was given to me secondhand by a friend who is an ultra-runner. 2 long runs and I was hooked. most comfortable hydration pack I have ever owned. Haha like something you won once-sunnies, was it? Excellent memory - it was sunglasses!! !